Introduction: I wrote the novel Aksinya: Enchantment and the Daemon. This was my 21st novel, and on this blog, I gave you the entire novel in installments that included commentary on the writing. In the commentary, in addition to other general information on writing, I explained, how the novel was constructed, the metaphors and symbols in it, the writing techniques and tricks I used, and the way I built the scenes. 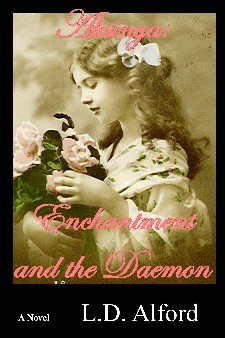 You can look back through this blog and read the entire novel–start with https://ldalford.wordpress.com/2010/12/12/daemon-installment-1-the-incantation/. I’m using this novel as an example of how I produce, market, and eventually (we hope) get a novel published. I’ll keep you informed along the way. At this moment, I’m showing you the creative process I used to put together the novel. Today’s Blog: To see the steps in the publication process, go to my writing website http://www.ldalford.com/ and select “production schedule,” you will be sent to http://www.sisteroflight.com/. I am writing about the extrapolation of science and technology to be able to write science fiction. I made the point that it is almost meaningless to try to fully extrapolate a universe (world) that is 10,000 years in the future (and maybe 1,000 years in the future) without applying some cultural and technological shaping. By shaping the cultures of your science fiction universe, you can shape the science and technology that is extrapolated. Here is how I culturally shaped the universe of The Chronicles of the Dragon and the Fox to make the 10,000 year extrapolation work. We are already getting into the integration of individual weapons with personal equipment. I didn’t intend to go there–yet, but integration is the wave of the future–for better or worse. The worse part is the cost–it really costs a lot to integrate equipment that you risk your life on. Federated or semi-integrated equipment is less expensive, plus if something goes wrong with federated equipment, some of the equipment still works. With fully integrated equipment if you lose the control systems everything is toast. That’s why I like semi-integrated equipment. That is equipment that is integrated for use, but can be still used as an individual piece. In other words, your weapons is semi-integrated into your helmet displays and controls. When you have on the helmet, the weapon integrates automatically. If your helmet fails, the weapon still works, you just lose some of the weapon’s capability. A wise designer would put features that are for the weapon (stabilization, direct targeting, safety controls, personalization, etc.) in the weapons and features for the helmet (targeting, low light visibility, communications, controls, etc.) in the helmet. So, for individual weapons, the future must be electronics and integration. This is the way of the world. Remember, however, that along side those electronic and integrated weapons, there will still be the simpler kinds. This is what we find today. As the technology gets better, the newer equipment will incorporate more electronics and integration, the old stuff will go to the next level down and surplus. Also remember, I’m trying to show you and give you examples of how to write a science fiction theme statement and turn it into a plot. A note from one of my readers: Speaking of which, I am awaiting for you to write a detailed installment on identifying, and targeting your audience, or audiences…ie, multi-layered story, for various audiences…like CS Lewis did. Just a thought. I’ll repeat my published novel websites so you can see more examples: http://www.ldalford.com/, and the individual novel websites: http://www.aegyptnovel.com/, http://www.centurionnovel.com/, http://www.thesecondmission.com/, http://www.theendofhonor.com/, http://www.thefoxshonor.com/, and http://www.aseasonofhonor.com/. This entry was posted in Daemon. Bookmark the permalink.